(MENAFN - The Conversation) Today, Sutton Bonington campus , part of the University of Nottingham, houses the schools of bioscience and veterinary medicine. But a century ago, during World War I, it was home to a prisoner of war (PoW) camp for German military personnel captured by the British on the Western front. And it was the site of a great escape , when Germans managed to flee the camp on September 25, 1917. At the outbreak of war in 1914 the government took over buildings and sites around the country to convert into PoW camps. Sutton Bonington was a group of buildings completed in 1915 for the Midland Dairy Institute, an agricultural college, but it was taken over by the War Office before the institute's staff and students could move in. Barbed wire fencing and some additional huts were added to the site and around 600 German military officers moved in. German officers who were made prisoners of war, by contrast with ordinary soldiers and sailors, were not allowed to work. Many became extremely bored, and sought to relieve the tedium by playing sports such as football and tennis, putting on concerts and plays, and planning how to escape. The preferred escape option was to tunnel under the barbed wire, and to disappear into the countryside beyond. Two attempts to tunnel out at Sutton Bonington failed, but the third succeeded, and at 1.30am on September 25, 1917, 22 men slipped, slithered and pulled their way along a tunnel, which was less than a metre high. They emerged into a field of turnips, and were hidden from the guards in the sentry posts by a ridge running through a nearby field. It helped their cause that the moon had set before they started, that the search lights were out because of concerns about Zeppelin raids, and that it was not raining. In terms of simple numbers, no other breakout was as successful. Usually only two or three men were involved with a tunnel project. The 22 from Sutton Bonington made it the largest breakout in Britain of World War I. The men planned to split into groups of four, preferably with an English speaker in each one, and to head for different ports along the east coast. They had maps and a compass with them, as well as food supplies which had arrived in the camp from Germany the previous day. The absconders hoped to stow away on board a vessel passing through the English channel, and return to Germany, re-join their regiment and re-engage with the war. The breakout was discovered at 4.30am when a policeman patrolling the village of Plumtree came upon Herman Genest walking alone but wearing a German officer's uniform. He arrested him, took him to the nearest police station, and from there saw him returned to the camp at Sutton Bonington. Genest had been free for approximately three hours. His arrest led to a roll call at Sutton Bonington which confirmed that 22 men were missing. All police, special constables, and other groups concerned with law and order in the area were ordered from their beds to find the Germans. Within hours they were reeled in. My own research into the episode has uncovered that three of the German men, claiming to be seeking work in one of Nottingham's munitions factories, were arrested at Trent Bridge. Two more, including the leader Otto Thelan, were arrested at Tollerton at 11am, and two others later in the day. Also arrested that day was Karl von Müller, a German naval hero from the early days of the war, who was found by children when he was blackberrying at Tollerton. The rest were picked up over the ensuing days with the last four German officers captured at Brimington Woods, near Chesterfield. A police sergeant found them on September, 30, 'and immediately upon being challenged they admitted their identity', according to a report a few days later in the Derby Daily Telegraph. 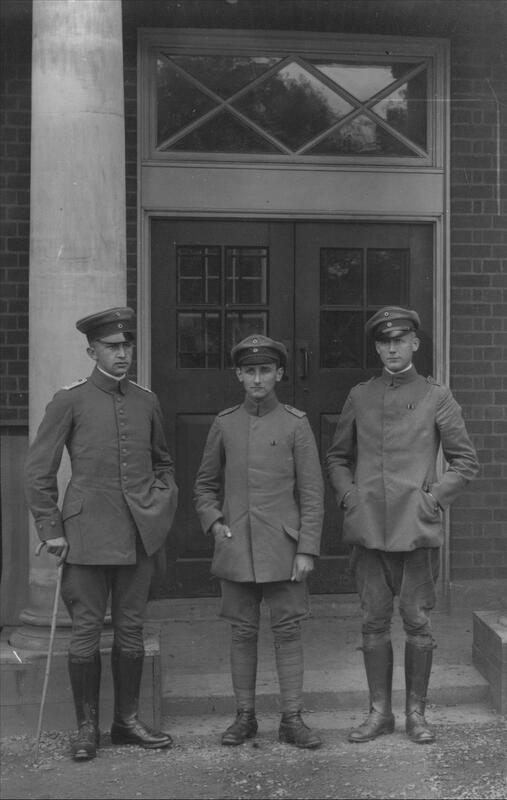 The experiences of these men were typical of other German prisoners who tried to escape during World War I. They were expected to wear their uniforms in camp, but this made them conspicuous if they managed to escape. They had to walk because catching trains was too problematic, and they normally travelled at night and hid in barns and hay stacks during the day. They carried food, but could struggle to find enough liquid, and if they reached the coast there was no guarantee of a passage across the Channel. Escape was a romantic ideal rather than a rational expectation. Gunter Pluschow, who escaped from another PoW camp at Donington Hall, in Leicestershire, was the only German to make it home in World War I, largely because he managed to adopt a disguise and stow away on board a cargo ship at Harwich. The Sutton Bonington camp was used for PoWs until February 1919 when those remaining were moved to Oswestry in Shropshire. The site was then cleared and cleaned, including the removal of the huts and barbed wire, and returned to the Midland Dairy Institute, which formally opened in October 1919. In 1946 the institute joined the University of Nottingham as the faculty of agriculture.